Making solar panels from scratch is a fairly simple process. Start small at first, get your first panel built and operating and then focus on the bigger projects once you have the gist of what you’re doing. You can find a lot of the materials you’ll need on ebay or on classified sites like craigslist. The most expensive part will probably be the solar cells so it would be in your best interest to buy them online at whatever auction site you can find them at. Don’t worry if they’re a little damaged; small chips around the edges are fine as long as there are no major cracks in the cells. When you’re making solar panels from scratch the cells are pretty much the hardest material to find. Everything else is fairly simple to find and you may even have a lot of the materials already in your house. After you have the solar cells taken care of, you’ll just need some plywood for the panel, plexiglass to cover the cells so that they don’t get damaged. Some copper wiring to connect all of the cells together and a storage battery to store all of the energy you generate. A smaller sized solar panel can recharge batteries and cell phones, power a small radio, even power a laptop. 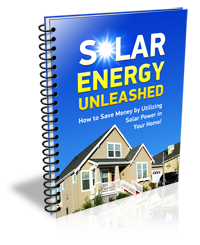 Once you get your small to medium sized solar panel working right and you know how everything works, then you can start larger projects and start making bigger solar panels from scratch; this way you can power more items in your house and save even more money on you utility bill.